The EFX 225 is the third machine in Precor’s Energy Series and the first one to offer motorized CrossRamp adjustability. It is a big upgrade from the manual adjustability option available in the two entry level models – 221 and 222 – and is designed to improve your workout experience and the overall functionality of the machine. 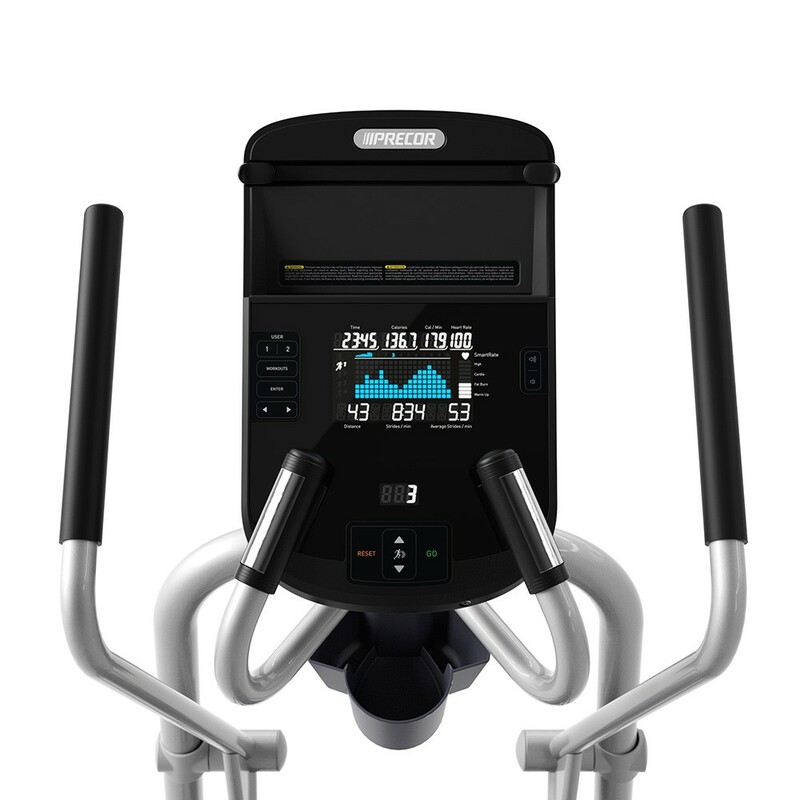 The Precor EFX 225 has a high-contrast LCD display with strides per minute, total calories, heart rate, CrossRamp level, time and distance. Get the EFX 225 Elliptical on Sale Now at the Precor Store! The first thing you notice about the Precor EFX 225 is its stability. It is very sturdy and weighs close to 200 lbs. The three base levelers at the bottom offer tremendous support and ensure there is no unwanted movement. So, the machine stays stable even if the surface is slightly uneven. Users seem to love the fully motorized incline, which allows you to change the incline angle instantly by pressing a button on the console, rather than having to do it manually every time. 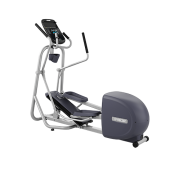 Moreover, the manual incline available in the base EFX 221 model and the EFX 222 elliptical only has three preset incline angles (15°, 20°, and 25°). The EFX 225, on the other hand, offers you eight degrees of customizability (15° - 25°) and allows you to change the incline angle in small increments. Just like the EFX 221 and 222, the 225 also comes with movable handlebars. It means you can focus on your upper body and lower body equally and enjoy a full body workout every time you step on the machine. The SmartRate technology tracks your heart rate and lets you know if you are in the right zone to achieve your fitness goals. Precor also lays a lot of emphasis on user safety, which is evident from the way they design their fitness equipment. The EFX 225, just like the base models, comes with a locking pin which prevents the foot pedals from moving when the elliptical is not in use. You can also lock the console using a sequence of key strokes once you are done with your workout. These safety features seem to have impressed many users, particularly those with small children at home. The high-contrast LCD display shows 13 different workout metrics – from the amount of calories burned to heart rate, distance, resistance, strides per minute, and many more. The console has button controls that allow you to change the ramp angle and resistance instantly. It also has a SmartGrip holder where you can place your tablet or smartphone and access all your files, songs, and movies. The downside, as pointed out by some critic reviews, is that the machine only has 10 preset workouts and lacks the option of customized workouts. The machine does come with five built-in workout accelerators, but at this price range you expect a lot more. Also, the elliptical is quite heavy and does not have transport wheels. So, you might find it difficult to move it around. Another gripe is that it has a very basic display rather than the web-enabled touch screens we see more and more these days, especially in this price range. You have to step up to the EFX 245 if you want a nice touch screen and Precor's Preva workout tracking capability. The EFX 225 is a quality elliptical crosstrainer from Precor. It retains all of the great features of the two base models and trades the manual incline for the much-improved motorized incline. It is built to last a lifetime and is backed by very good warranty as well. If you are satisfied with preset programs and do not need custom workouts, the 225 is a great choice for you. If not, you should take a look at the EFX 245. For a few hundred dollars more, you can get a machine with more preset programs, custom workouts, a touch screen and workout tracking technology.